With attractive white flowers, the white belladonna lily is ‘Belladonna Hathor’. This is a variety with beautiful flowers, the best formed of all of the Belladonnas, and it has fragrant flowers as well. The flowering time is in late summer to autumn and these are an easy care plant.. The flower stems will reach around 70 – 80cm and are followed by strappy foliage. With up to 12 individual trumpet shaped flowers on each stem, these are a very hardy bulb for Australian conditions and seem to thrive on neglect. The flowers are particularly attractive in the morning and evening light. Opening sequentially over a few weeks, the petals are a pristine white with just a touch of yellow in the throat. Best planted in late spring although they can be planted in late summer. 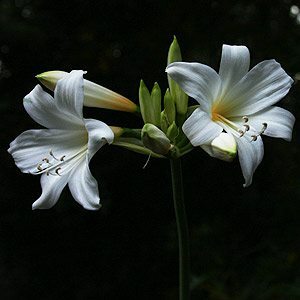 The White belladonna lily requires the same conditions as others. Sunny well drained and best left undisturbed. The bulbs need to planted with the necks of the just above the soil level. ‘Belladonna Hathor’ will grow in part shade, however it will reach for the light, so full sun is best, with perhaps some protection from the hot afternoon sun to prolong flower life. Over time these bulbs will spread to form a large clump. After 5 years they are generally ready to divide. The best time to divide them is when the foliage dies back at the end of winter. If you do plant in summer you will need to water in with a liquid seaweed fertilizer. The only other fertilizer required is a general purpose type when the foliage appears. However these are not a hungry bulb so don’t fuss.